More than a year ago we’ve launched our real-time satellite imagery processing service that opened completely new ways of Sentinel-2 exploitation. It’s amazing to see how individuals, research organisations and companies are using it. Powered by multi-spectral engine and custom scripting we’ve seen it observing wild-fires, classifying clouds and powering several precision farming applications all over the world (e.g. http://cropsat.dk/). We currently process about one million requests per day. Our efforts in the last months were focused mostly to adding new sensors to the platform — Landsat 8, Sentinel-1 and others (see all), bringing more and more Earth observation data to our users. However, all along we have known that the real power of remote sensing lies in ongoing monitoring based on multi-temporal processing of data, where final image is composed by combining several overlapping satellite images from given time-range. This way one could use Sentinel-Hub to get most recent state of vegetation of a corn field by combining e.g. last 3 months of the data over the field, in return getting much wider context, making it possible to estimate the harvest time and volume. We started to work on multi-temporal functionality a few months ago and we have a beta ready for interested users to play with. We have asked Pierre Markuse, whose remote sensing tweets are always a delight, to give it a try. 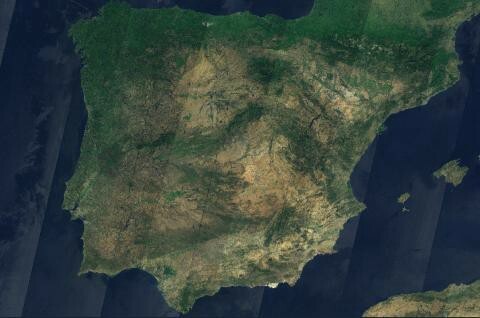 He created a beautiful cloudless mosaic of Iberian Peninsula, using 2 months of Sentinel-2 data. The result is not just good looking — such mosaics can be used for analysis, preventing clouds to interfere with results. We did some of our own tests, even though it is clear we are lacking the talent Pierre has. We tried selecting the darkest pixel — one of the classical methods for “cloudless mosaic” — on last month of data over England and it seems that some areas did not see the sun this summer. Last images over the area on the left (from 18th of August) and mosaic on the right, created using darkest pixel method. You can play with it over any place in the world: select date and mosaic of one month data up to that date will be created. Be patient! The process is still a bit slow, it is beta after all. Maximum NDVI over an area gives one quite a homogeneous overview on vegetation. If you compare quarterly mosaics, it is possible to do some basic classification (check more about it at ESA Open Science conference in September). By observing the difference of Normalised Burn Ratio, it is possible to detect harvested fields. However, these are just first tries. Change detection, wildfire monitoring … we are most interested to see, what kind of results remote sensing experts will come up with. For those curious in exploring this functionality, contact us. Once the feature is ready for prime time, we will let all our users know about it.